I wanted to share these quick snaps of my sofa area with you as it features some of my cushion designs! I am super happy with this little section of the living room, I am just on the look out for a rug to add a little warmth to the look. I thought I would order a couple myself to check the quality and they are really durable and perfectly made printed onto a lovely quality of fabric, shipped from america they take no longer than two weeks to arrive.My favourite has to be the blue glitter Cushion it just looks super dreamy with the blue tones mixed with silver glitter. 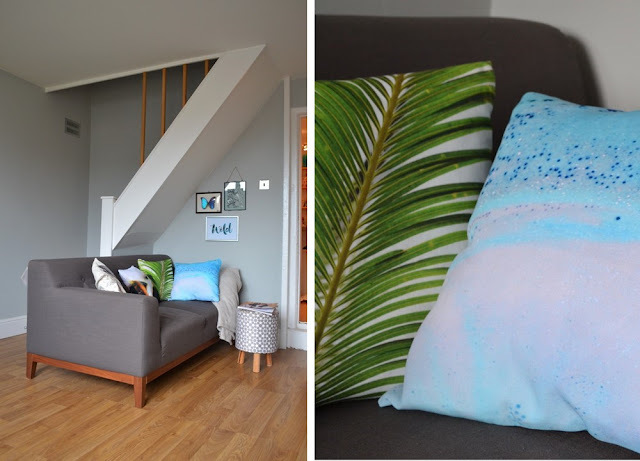 I love to mix and match patterns and the tropical palm design adds a vibrant pop of colour, the bristol print cushion features a photo I took using my Diana dreamer lens camera to capture Bristol suspension bridge I love this print as it reminds me of home. I hope you like my new homeware designs which you can check out along with lots of other products and prints over at my Society 6 page! Ohh and also at the moment you can get money off and free shipping!